Whoosh enables you to create breath taking whoosh and pass-by effects. Precisely design sounds varying from whistling wind whooshes to air ripping engine pass-bys or completely over the top granular sci-fi effects. 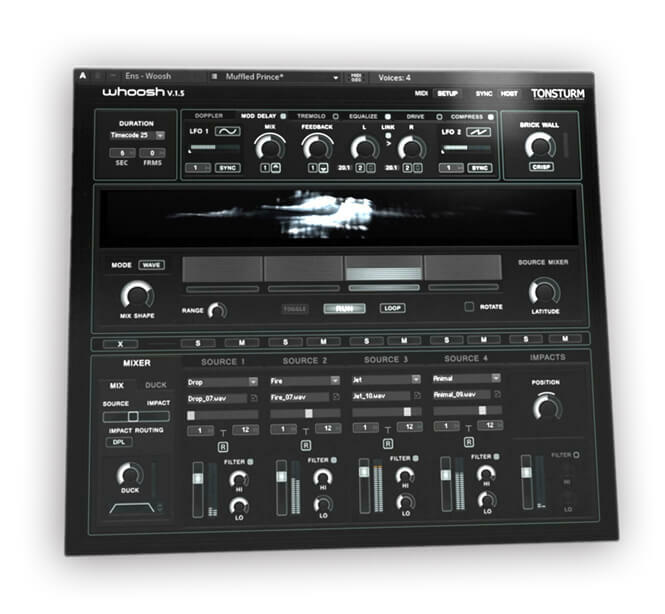 Whoosh is a true sound design instrument and enables you to create breath taking whoosh and pass-by effects. It is possible to precisely design sounds varying from whistling wind whooshes to air ripping engine pass-bys or completely over the top granular sci-fi effects. The included doppler effects engine was designed from ground up to physical model the acoustic phenomena of an object that approaches, passes, and recedes from an observer. The individual playback engines, the source mixer and doppler engine can be manipulated in synchronized connection to each other. This makes it possible to playback the desired sound effect at different durations while remaining everything in perfect sync. Whoosh comes with an extensive onboard sample library licensed from leading sound effect recordists. It includes categories like wind, fire, racing car, jets, metal, water, wild animal and explosion effects. Build for the freely available REAKTOR PLAYERWHOOSH is a third-party instruments that has been made specifically for REAKTOR PLAYER. It needs to be installed with Native Access. WHOOSH runs with the REAKTOR PLAYER & the full version of REAKTOR. Completely overhauled sample managementWHOOSH now offers 4 user banks for the source and impact samplers. You can now directly Drag & Drop your custom samples from your browser on to the interface. Differently compiled user banks can be saved with the WHOOSH user presets. Huge and expanded factory SFX libraryWHOOSH now comes with over 390 expressive sound effects: Racing cars, flame throwers, explosions, wild animals and a lot more! NKS support and updated MIDI functionalityWHOOSH now fully supports Native Instruments NKS format. Controlling WHOOSH from any Midi controller with it´s new Midi Setup function is a breeze. Overhauled synchronization featuresWHOOSH can now precisely be synced to timecode (24 / 25 FPS), SecMsec and the hosts Beat Sync. Complex and but intuitive to use sound design engine.4 Grain / Loop Samplers, 4 Impact Samplers, Wave Mixer, Doppler Engine and Post Effects - All these different Engines are precisely working together an can be intuitively controlled to sculpt breath taking Whoosh & Pass By sound effects. Real time control your whoosh SFXIn Manual mode you can manually perform the powerful WHOOSH engine in realtime. Randomization featuresAll samplers feature a flexible randomization function. Comes with 100 Presets100 diverse presets feature all styles of SFX that can be achieved through the powerful WHOOSH engine. You already own a previous version of WHOOSH? Please check your email inbox for upgrade notifications from us or contact us and get a discount code. Internet connection is needed to register WHOOSH via Native Access.